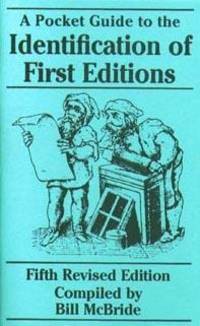 The Pocket Guide to the Identification of First Editions is an indispensible guide for anyone interested in the world of book collecting. This small, easy to carry guide contains information about general edition identification circumstances to help you determine whether your book is a true first edition, or just a common book club edition or second printing. It also includes an alphabetical list of publishers with a key to the marks that they use to identify their editions. McBride Pub, 1995-01-01. 5th. Paperback. Good. McBride, 2001-01-01. 6th. Paperback. Used:Good. Hartford, Conn.: McBride/Publisher, 2012. 7th Revised Edition. Stapled Softcover. New. 16mo - over 5¾" - 6¾" tall. McBride/Publisher, 2012. 7th Revised Edition. Soft Cover. New.